TFK Group are one of Irelands Leading commercial vehicle suppliers and container specialists. 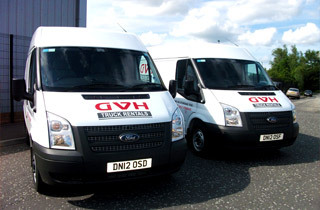 We are a family run company with over 40 years of experience in the transport industry. At all times the company carries a wide range of both new and used lorries and trailers, a full range of vans large and small. If the vehicle you are looking for is not in stock we will try our best to source it for you. We also carry a massive stock of containers in varying sizes and types. Our on site TFK Self Storage solutions offer a flexible answer to your storage problems. Finally, our Global Steel Arch buildings provide a quick, strong and versatile answer to your accomodation needs. These versatile and extremely durable alloy steel buildings are composed of Galvalume coated steel, a special steel alloy developed to provide lifelong durability with a 20-Year perforation guarantee. Please use the links withing our group site to call over to our various company websites for more information. If you need to find out more please call any of our very experienced team and they will be able to help you.